A recent article published in the Annals of Internal Medicine (Ann Intern Med. 2014;160:398-406; March 18, 2014) reported on a meta analysis of over seventy population studies (but it considered many more that were not included because of inadequacies of some kind) concerning the roles of dietary fat on Coronary Heart Diseases (CHD). The authors came to the conclusion that intake of saturated fat was not highly associated with cardiovascular disease. Although this may be shocking to some, it is not shocking to some researchers who have been following this field for thirty years or more. Before reviewing the major findings of this study, I would like to take you on a walk through the history of this topic. The start of the major interest in this topic took place in the late 1940s and early 1950s when middle aged American men started to have heart attacks in astronomically large numbers. Researchers at the time began investigations into why these heart attacks were happening. 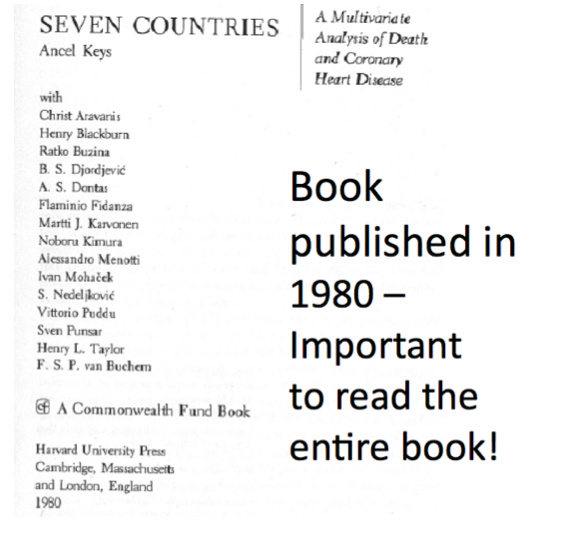 The premier study at that time was “Seven Countries” Study that was directed by Dr. Ancel Keys, a renown epidemiologist at the University of Minnesota. This was a massive study that followed 12,763 men, aged 40-59, from seven countries: Finland, Greece, Italy, Japan, the Netherlands, the United States, and Yugoslavia. The overall findings (from many published articles) of these studies, including the 10-year follow-up, were published in a book, “Seven Countries” by Ancel Keys (1980). 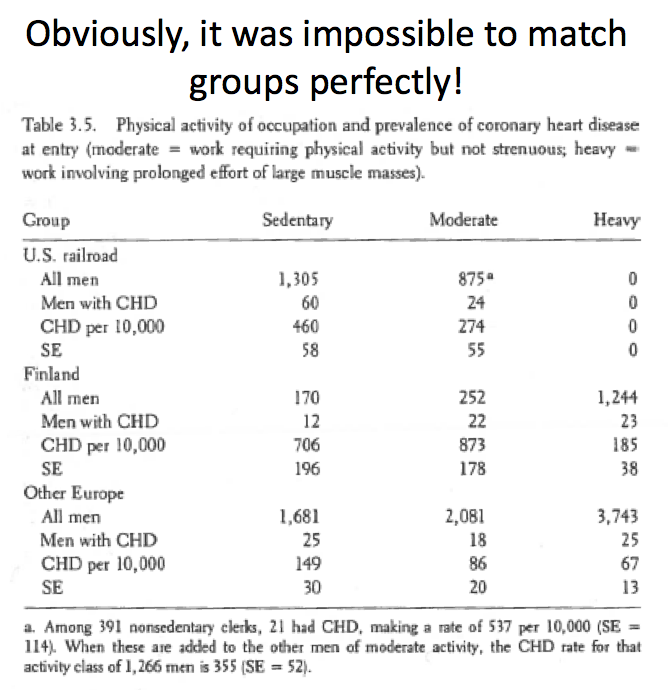 Interestingly, the “Seven Countries” study was stimulated by the basic observations that blue collar workers suffered less heart attacks than white collar workers, and that high serum cholesterol was associated with higher heart attacks in these workers. These observations were certainly true, but the interactions of lifestyle factors were more complicated than initially realized by Dr. Keys and co-workers. Also, there were several powerful confounding factors present at the time that made the actual conclusions difficult to discern clearly. One important problem with the Seven Countries Study was that in the US cohort, over 50% of the subjects (men) were current smokers and many were former smokers (approximately 30%). Smoking was also high in the other populations studied. Therefore, this study is primarily concerned with smoking males, and the conclusions drawn from it may only precisely apply to this group of humans. Let’s step back and discuss what happened in the early 1950s to cause the epidemic of heart attacks among middle age American men? 1)Most were victims of participating in World War II and were subjected to very high stress, now known to be an initiator of early coronary plaques. 2)Furthermore, most of these men were initiated into the habit of cigarette smoking by their respective armed forces. 3)American men back from service in the Armed Forces went back to college and thereafter led, for the most part, sedentary lives. 4)And finally, an increase in their standard of living did increase the intake of fat (especially saturated) in the forms of increased animal product intake (meat, milk, butter). In fact, the data on per capita consumption indicates that the intake of fat during the 1950s was the highest ever recorded for most Americans, somewhere approaching 40-45% of the total Kcal intake was from fat. These events happened relatively simultaneously, and could be construed as a “perfect storm” for an increase in heart attacks and other forms of cardiovascular disease. 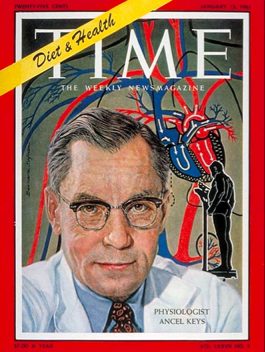 Although there were several factors responsible, the factor that was probably blamed the most (by researchers and officials) at the time was serum cholesterol (and the intake of fat, especially saturated fat, in the diet) because other studies indicated that high intakes of saturated fat did, in fact, increase serum cholesterol. However, if you read Ansel Keys’ book all the way through, you will find a balanced view of the fat/cholesterol hypothesis presented by the author. Right in the beginning of the book, Dr. Keys states that there are observations he can’t explain. 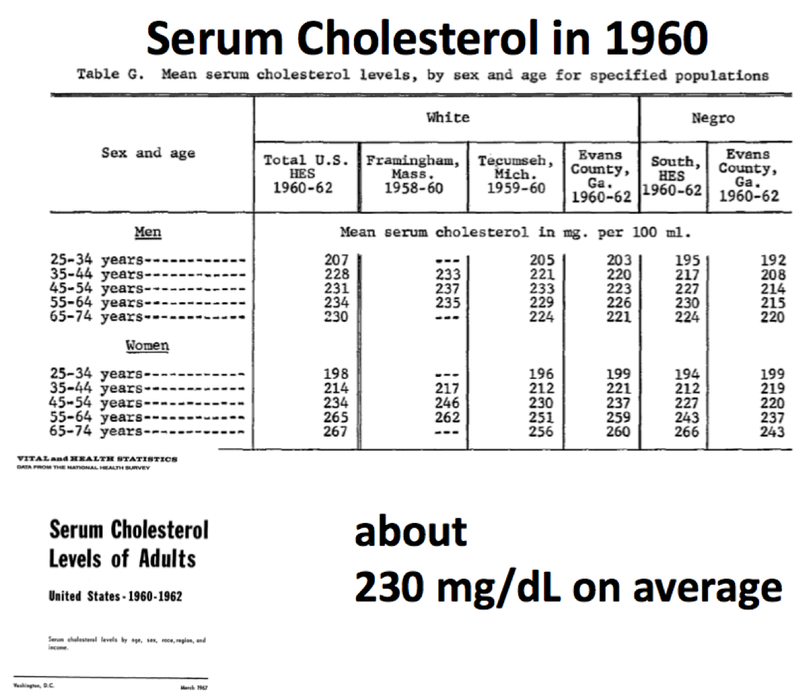 And one of the major findings that is often misconstrued is that the major point Dr. Keys actually made was that serum cholesterol was associated with CHD primarily at the higher levels of serum cholesterol. After the early reports from Ansel Keys and other researchers, there was a concerted effort by certain government panels and private organizations to lower dietary fat, especially saturated fat, in the American diet. Although the exact reasoning and outcomes have been debated, beneficial effects on health were eventually observed with a ten year delay, after the public responded to these recommendations. For example, in 1960, several studies measured blood cholesterol at 230 mg/dl in American adults. 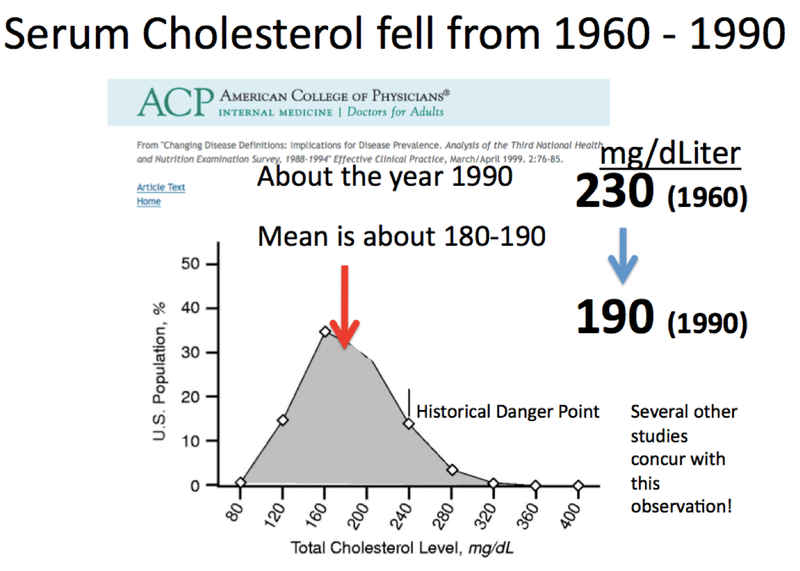 By 1990, the mean serum cholesterol concentration in American adults had fallen to 190 mg/dl. During this time, the numbers of heart attacks peaked in about 1970 and started to progressively fall afterwards (See data from the AHA below). And after statin drugs were introduced starting in the 1980s, the results were that many men who would have died in their 40s & 50s, died of heart attacks much later, such as in their 70s & 80s. My father had his 1st attack at the age of 85. Many of us have benefited greatly by having our fathers 20-30 yrs longer because of Ansel Keys and the those who proposed the cholesterol hypothesis. However, this story is very complicated, and I will continue the story in later posts. Below are a series of original figures and tables from the book, “Seven Countries,” by Ansel Keys and many of his co-workers. I have inserted arrows and comments throughout! The figures below were selected and copied from Ansel Key’s Book. This is an interesting table since it shows that the US cohort did not match the other cohorts in level of physical activity. Another blinding observation that can be made from this data is that physical activity appears to protect against coronary heart disease. However, analysis of the entire study indicated that lack of physical activity was not a risk factor. One wonders whether there was a problem in measuring level of physical activity in all the different locations of the study. This problem remains today although the development of specialized activity monitors may help with this type of analysis in the future. 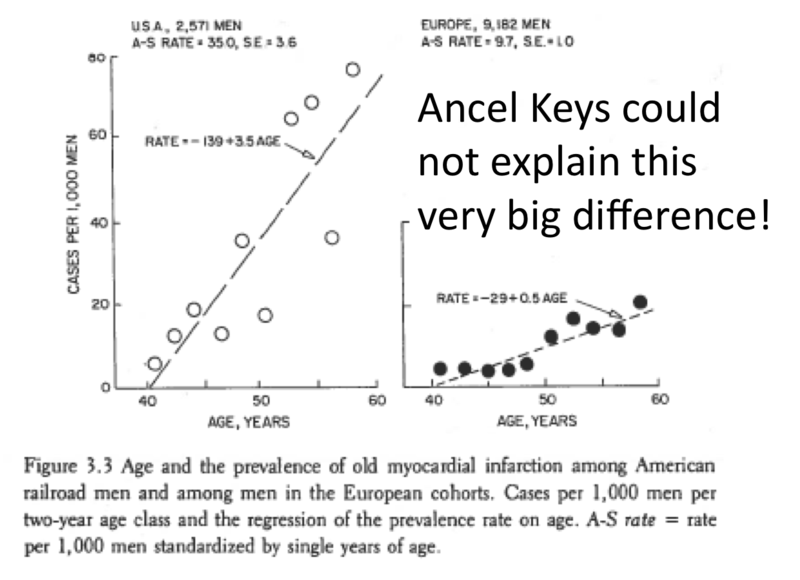 Ancel Keys could not explain the above large difference in CHD deaths between the US cohort and the European cohorts. In part 2, I suggest some hypotheses that explain this major difference. 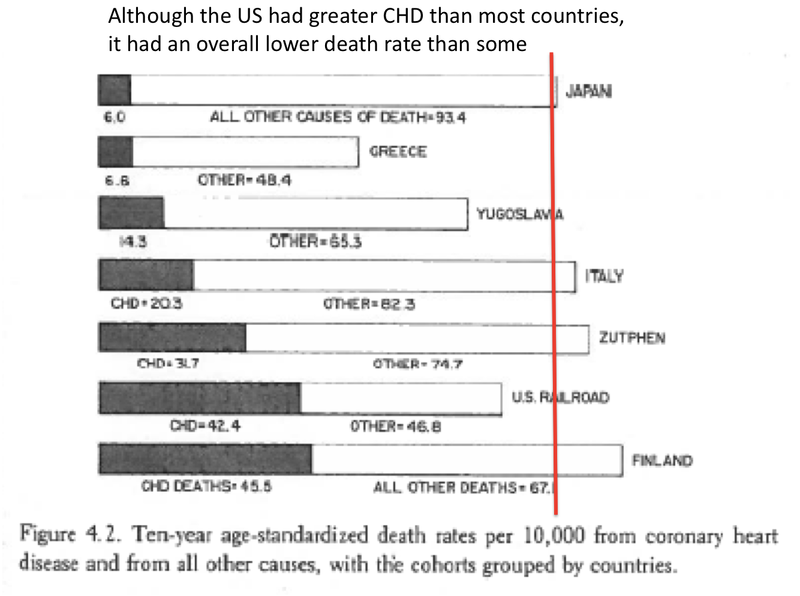 Note that although US CHD deaths were higher than most other countries, the overall death rate was not as high in most cases. This reflects other aspects of life such as availability of antibiotics, basic quality of the overall diet, and physical environment factors such as reliable transportation and sanitation. was highly associated with serum cholesterol levels across the “Seven Countries.” As will be described later, this relationship is complicated by many factors. The relationship of CHD deaths with total intake of fat is another famous relationship from the “Seven Countries” study. I have drawn a vertical red dotted line at 40% of total Kcal from fat. The data points along this line show that the effects of total dietary fat is complicated and modulated by other factors. 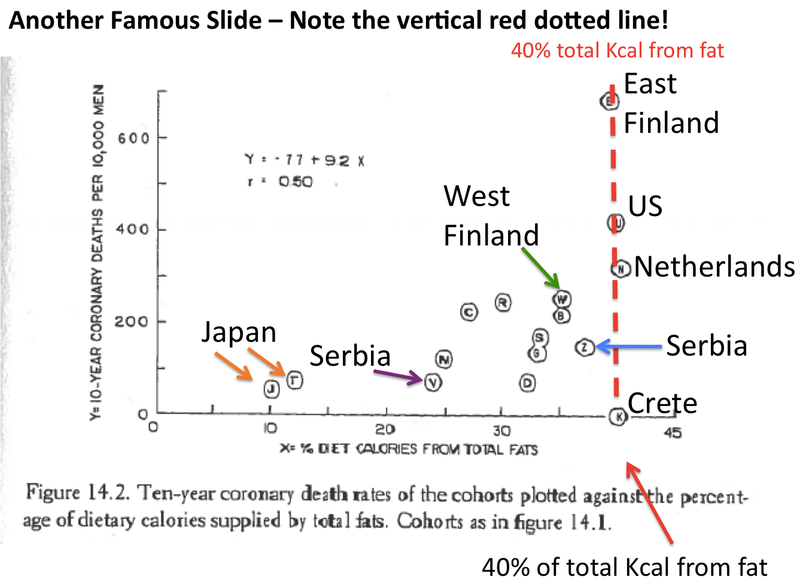 The data point for West Finland is interesting because this area did, indeed, have a very high intake of fat that was enriched in saturated fat from animal sources. The high number of deaths due to CHD certainly fits Dr. Key’ hypothesis. The data point for deaths in the US cohort reflects diet and many other factors that we will discuss in detail later. The point that was most interesting was that from the Crete cohort. 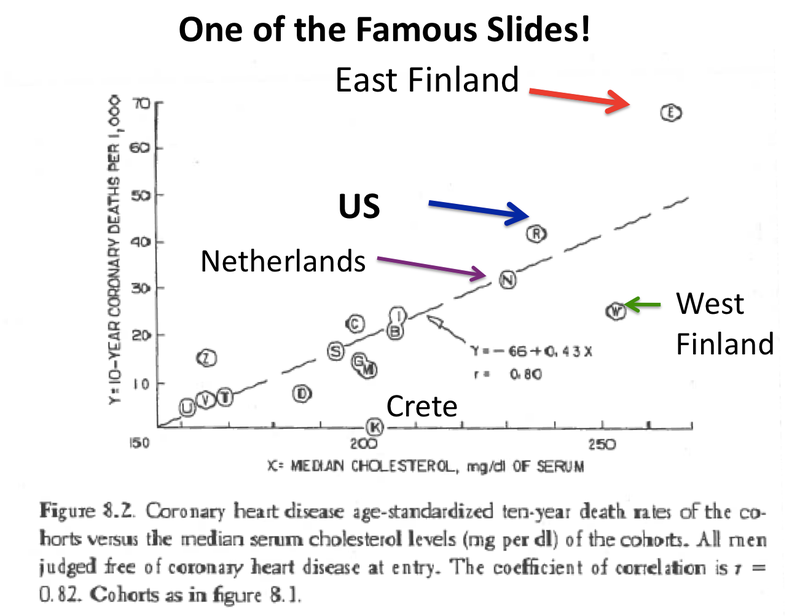 Although men from Crete consumed a high fat diet, there were zero deaths from CHD. We now know that this reflects their consumption of the Mediterranean diet and the protective effects of a high intake in marine fats that contain omega-3 fatty acids. This data illustrates the importance of the type of fat consumed. In 1960, several studies measured blood cholesterol at 230 mg/dl in American adults. 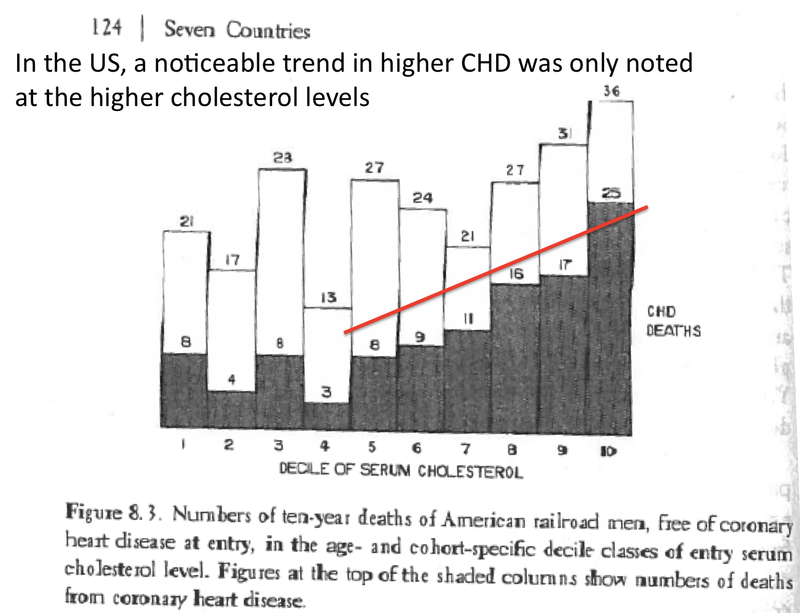 By 1990, the mean serum cholesterol concentration in American adults had fallen to 190 mg/dl. 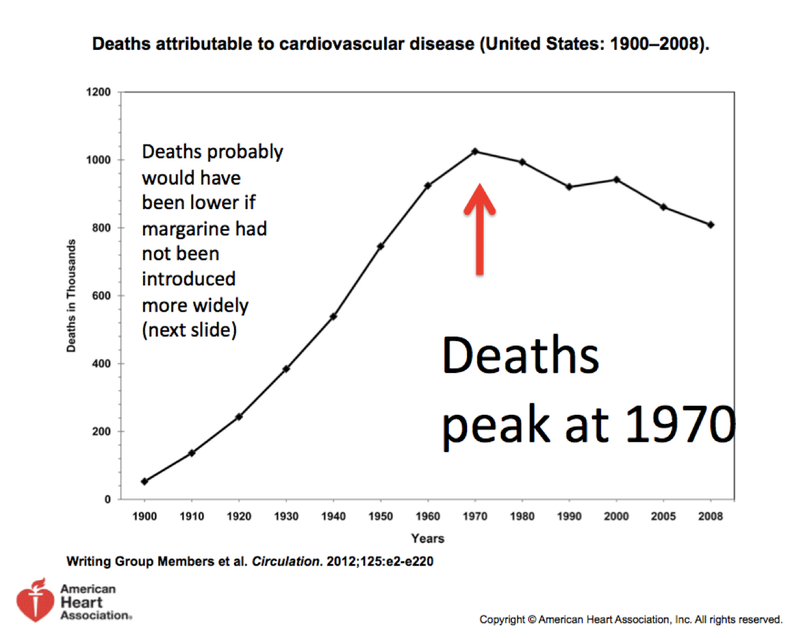 Although there was a lag of 10 years, the epidemic of deaths from CHD started to decrease starting about 1970 (Last Slide). Again there may be many factors involved in this turn around, but the decline in serum cholesterol concentrations must be an important contributor. Part II Will be Posted in a Few Weeks!